In this week’s issue we’re talking all about the natural kingdoms of the DC Universe! 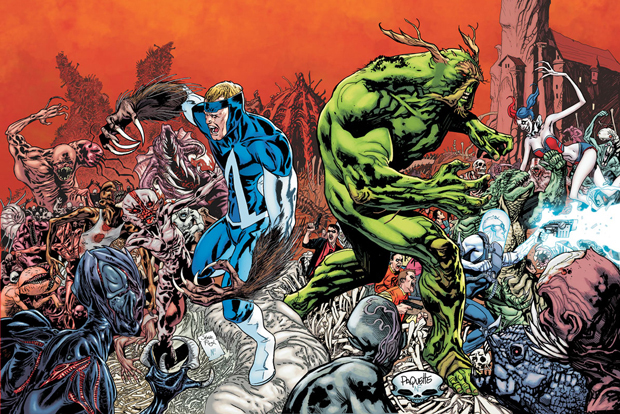 (39:29) Is the New 52 Animal Man worth reading? Does it tie in to Swamp Thing? (41:36) Will the Grey Kingdom ever get its own series? (43:32) How does Earth 2 Green Lantern fit in? What about Stan Lee’s? (46:53) If all the current avatars were to sever their connections, who would you like to see become the new avatars? (51:53) What do you think of Charles Soule run of Swamp Thing adding Machine and Bacteria? (55:48) Poison Ivy evolving from a gimmicking villain to an anti-hero with ties to the Green. (1:00:35) Were Beast Boy’s powers always connected to the Red? (1:03:52) Has there ever been reference to these realms existing on other worlds? Have they ever been connected to our own? (1:10:37) How does the Morphogenetic Field actually work? (1:15:37) What would be a good starting off point reading-wise? (1:21:00) Does Vixen or Beast Boy get their powers from the Red? (1:23:36) Why don’t we see more of the other kingdoms like the Clear or the White?